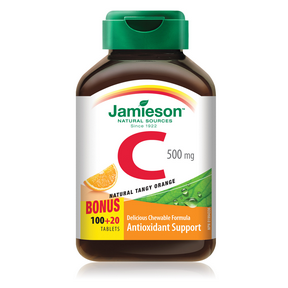 Jamieson Vitamin C Chewable 500 mg - Tangy Orange offers all the benefits of vitamin C in a great-tasting, chewable orange flavoured tablet. Non-medicinal ingredients: Dextrose, cellulose, vegetable stearic acid, vegetable magnesium stearate, natural flavours (orange, lemon, grapefruit and lime), silica, sucralose. Consult a health care practitioner prior to use. Always read and follow the label. Adults: Chew 1 - 4 tablets daily.